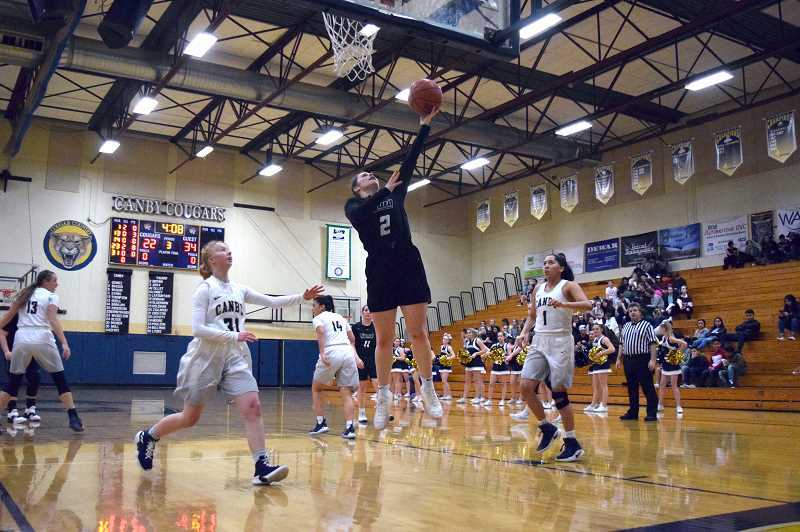 Tigard's girls' basketball team swept the Three Rivers League (TRL) the first time through, and looks to be in fine form as it heads into the back half of league. 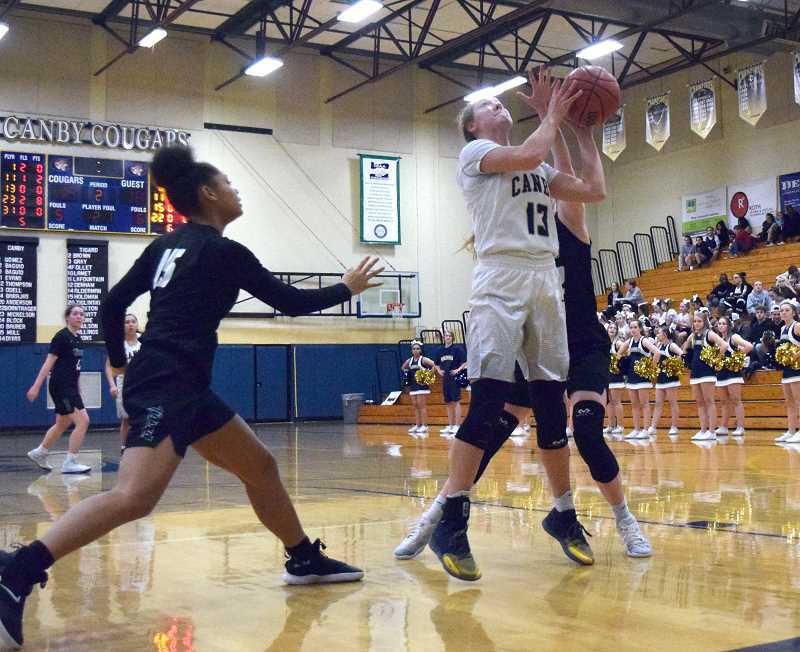 Headed into hostile territory against the Canby Cougars, Tigard was able to remain unbeaten in TRL play with an 8-0 record, getting the win 50-39. "We were confident coming in," Canby head coach Chuck Knight said. "I think we felt like we could play with them at their place. We built a big lead in the first quarter, and were in it all the way up until the last seconds of the third quarter of the game. Tonight, we were still down two (at the same time period), so I felt like we could compete. They're such an experienced team that you have to play a solid 32 minutes." "They were playing great defense, and we weren't getting easy looks," Tigard head coach Steve Naylor said. "We finally made a couple shots and made a little run there and got into halftime in the lead." Canby did not make it easy on the top team in the Three Rivers League though. The Cougars started the game with a strong offensive effort due in large part from the efforts of Nicole Mickelson. 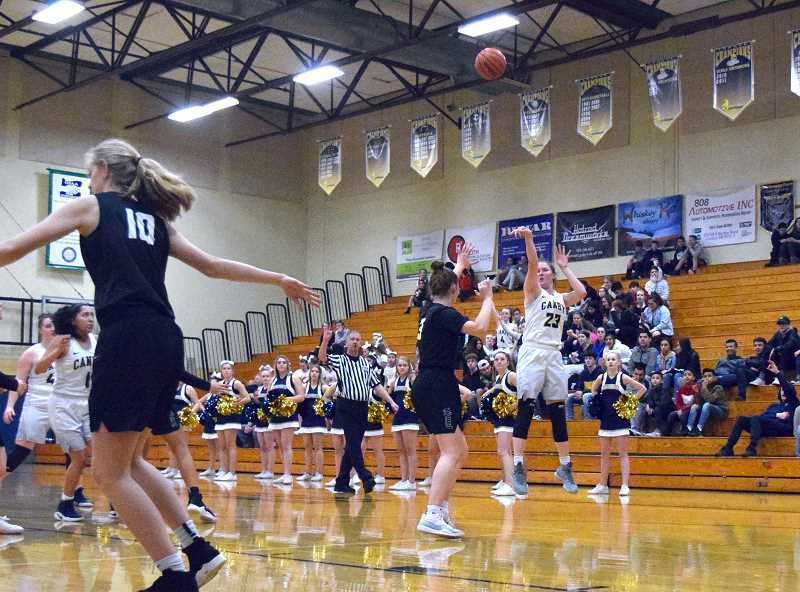 The 6 foot Canby junior scored the first three field goals for the home team, and tacked on a pair of baskets from the free throw line. Freshman Joey Baguio made her presence felt as well, picking up a steal, a basket, and going 1-of-2 from the from the charity stripe. "On the court, we had a really good positive mindset," Mickelson said. "We were ready to go, we were ready to compete with the No. 1 team in the state, and everyone wanted to get that win. We came in off three game win streak and were really positive and sure we could do this. It was a really positive mindset." 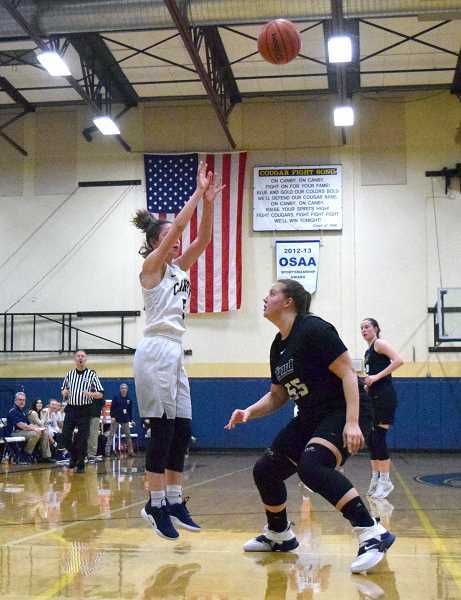 In the second quarter Canby stretched the lead to nine points with a pair of "3's" from Baguio and senior Amanda Davis. From there though, Tigard put the pedal to the floor. Campbell Gray scored 7 straight points, including converting on an and-one play to shorten the deficit to just three. Minutes later Canby grabbed three points to keep the lead at 20-18, but Tigard continued to force the issue. Particularly important, the Tigers defensive press forced a numbers of turnovers and easy baskets in the paint. The Tigers proved why they are among the top teams in the state by starting off the final quarter of play with a 9-2 run. Conversely, Tigard's stifling defense held the home team to just 5 points in the final quarter. At the end of the game Canby was down 50-39. 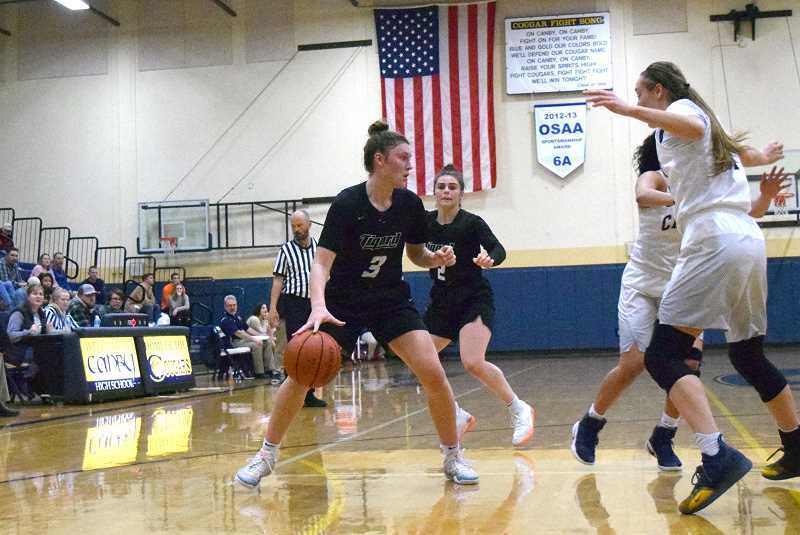 A big part of Tigard's success offensively came thanks to Gray, who recorded 29 points overall. The next closest scorer was LaFountain with 7 points. 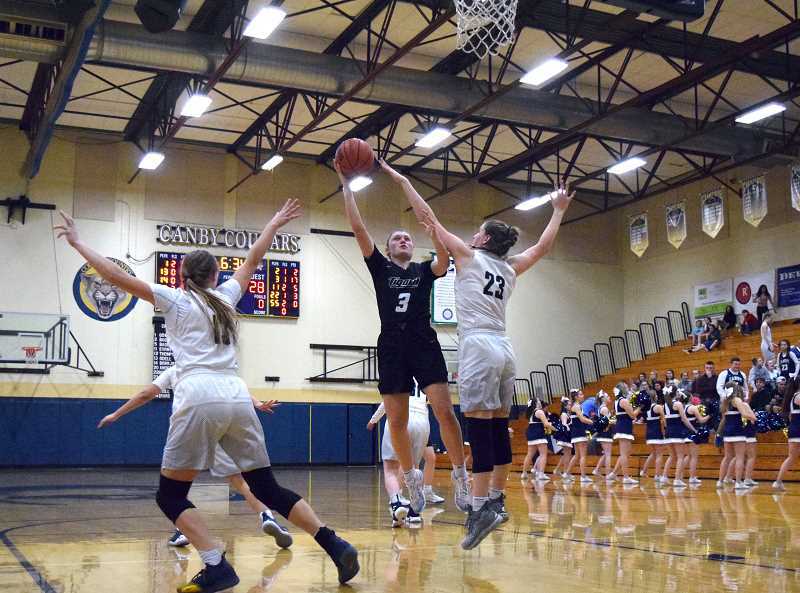 The defensive press was also what disrupted Canby's offense in the second quarter and established that initial 8-point lead. For Canby, Mickelson led the way with 12 points, followed closely by Odell with 10, and Baguio with 9. "We really need to practice on getting the full 32 minutes," Mickelson said. "We kind of slowed down in the second and fourth. We need step up and get the full 32, and that's a really big key to our practice. Another thing is getting those younger players to step up into their roles, and they're doing a really good job so far. I think that'll help." Canby sees a three game win streak snapped, and falls to 7-12 overall, and 3-5 in league play. The Cougars will square off with Lakeridge (3-5 in TRL play, and 8-9 overall) on Tuesday, Feb. 5. Tigard stays sterling in league with an 8-0 record, and improves to 17-2 overall. The Tigers put a 10-game win streak on the line against West Linn (7-1 in TRL play, 14-4 overall) on the same day. After the game Mickelson had ice on her right leg, a result of a collision with one of Tigard's players. The hit aggravated an LCL strain suffered earlier in the season. "I think I'll be fine," Mickelson said. "I don't blame their player at all, it's a hustle play and everyone has those moments. I'll be good."